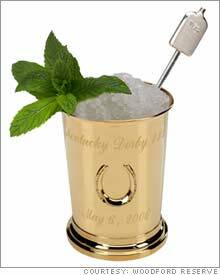 FourFreedomsBlog - Mint Julep Anyone? NBC News has learned that Trent Lott's in the midst of informing close allies that he plans to resign his senate seat before the end of the year. It's possible a formal announcement of his plans could take place as early as today. "Out of the rubbles of Trent Lott's house - he's lost his entire house - there's going to be a fantastic house, and I'm looking forward to sitting on the porch." Let's make George's wish our desire. Let's give him time to go sit with Trent on that porch. * Invading Iraq without any threat to the U.S.
* Ignoring countless warnings of an attack in the U.S.
* Letting terrorists buy high-powered weapons inside the U.S. So yes, it is Monday. I put out some leftover Apple and Pumpkin Pie this morning. I sent the [im]Peach Pie to my representative's office... The espresso is on (and the home made whip cream tastes delish on top! Hang in there, Today is Cyber Monday so start your shopping from the comfort of your office chair!